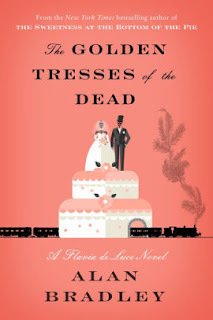 The Golden Tresses of the Dead by Alan Bradley is the very highly recommended 10th Flavia de Luce novel. Twelve-year-old Flavia has formed a private detective agency with Dogger and the two take on their first case and client. Arthur W. Dogger & Associates, Discreet Investigations, is now in business at Buckshaw. Flavia and Dogger discover their first case at her sister Ophelia's wedding in the chapel at Bishop’s Lacey. How did a severed finger end up in the wedding cake and who does it belong to? Then they take on their first client when Anastasia Prill asks them to find some stolen letters belonging to her father. The case deepens when something happens to Miss Prill and two missionaries, Doris Pursemaker and Ardella Stonebrook, end up staying at Buckshaw. While Flavia and Dogger are applying their detective skills to the cases, Flavia's cousin, Undine, seems intent to be in the way. Flavia is well established as a chemistry prodigy in the series set in 1950s England. It's always nice to see a strong female character with a gift for science featured in a novel. At this point she is a well-developed character and it is entertaining to follow along the plot as she deduces clues, works in her lab, and follows leads to solve the case. Flavia and Dogger work great together and it's nice to see him gently helping Flavia. I would predict that Undine is going to begin to play a much larger role in the books and will take over Flavia's former bratty persona, as in this outing Flavia is definitely maturing and growing up. It almost seems that she is older now and might need another birthday soon. These are all well-written novels and are Bradley inserts a fair amount of humor in the narrative that makes these novels even more enjoyable than simply a who-done-it. While not YA, all of the Flavia novels are suitable for teens to adults. They should be read in order so you have Flavia's whole backstory and family history. The word is the Bradley will be continuing the series, so expect more cases for Arthur W. Dogger & Associates, Discreet Investigations in the future.